Engine Mounts: 133080 - Chev 181 - 502 Borg Warner, 4-pt Aluminum Bottom Starter Mount, Bell Housing (not exactly as shown). from California Marine. 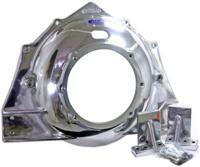 Description Chev 181 - 502 Borg Warner, 4-pt Aluminum Bottom Starter Mount, Bell Housing (not exactly as shown).